Posted August 16, 2008, in Design. A lot of Movable Type users are about to be given another great reason to upgrade to Movable Type 4.2: the release of the Mid-Century template set by Jim Ramsey. 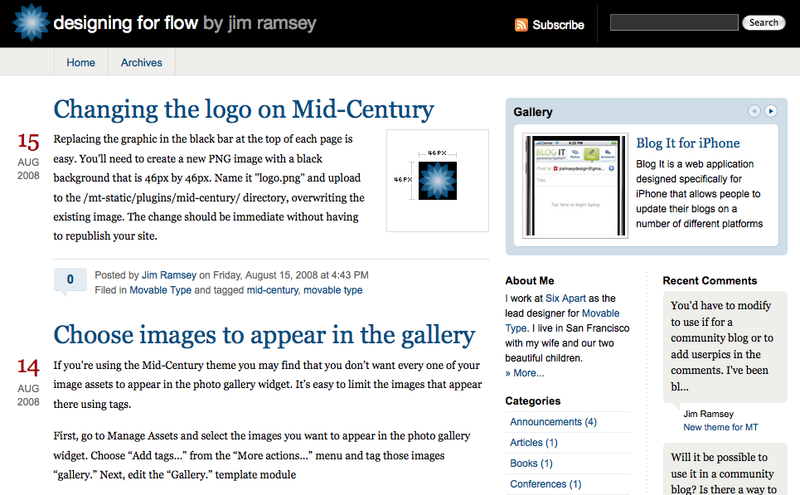 Jim also designed the Professional Website template set (formally known as the Universal Template Set), which is largely regarded as one of the best and most flexible packaged designs for Movable Type and also comes bundled with Movable Type Pro. Jim is setting a new standard for design on Movable Type, not just in aesthetics, but in functionality. We are also happy to make this wonderful blog design available to the world for free under an open source license to encourage others to build and expand upon it. Download the Mid-Century Template Set now, and when you have it deployed let us know with a comment so we can see what you have done with it. I like it. Where can I find other themes or tempate sets? Clicking on the ‘theme’ link in the breadcrumbs on the Mid Cetury page gets a 403 error and clicking on either the ‘template set’ or ‘theme’ tag links gets only the Mid Century theme descriped here. We need more themes like this! We’re working on it. For one you can find the Professional Web Site theme in Movable Type Pro. Because I paid for MT Pro, and the features now available in the free blogger licensed version of MT 4.2 were not included in the version of MT Pro that I purchased, I will now have to download and install the free version of MT (after I have already had 4.2 Pro upgraded). Do you understand how ridiculous this is? Did anyone at MT even consider what you were doing to your paying customers by doing things this way? Do you have any idea how thoughtless and … I see that MT is trying to go more open source and more user-friendly, but these are your paying customers and they are being punished for buying a license from you. It makes absolutely no sense. Please consider why you are doing things this way and the message it sends to your paying customers. Everyone who previously purchased Movable Type 4.0 and 4.1 Commercial License will automatically be upgraded to Movable Type 4.2 under the same terms, but without the community features. But also, those folks will also be offered a free upgrade to Movable Type Pro 4.2 with the community features. Users are free to download and install MT Pro provided that they accept the new terms of service associated with this update. Given that our licensing terms now include a limit of 5000 profiles, we didn’t want to put anyone in a position where by virtue of our releasing new software and them upgrading, they would be in a position where all of a sudden they would be in violation of their terms of service. That would be bad — a lesson we learned long ago. So we decided to give everyone an option to continue using Movable Type Commercial under their existing terms, while still being able to take advantage of all the security and performance enhancements we had made to the core. While also giving them an option to MT Pro under new terms. That is why customers see two products in their account: Movable Type 4.2 Commercial License, and Movable Type Pro 4.2. In summary, I am very sorry you had problems upgrading, but I assure you it does not appear to be the norm, leading me to believe that something has gone wrong with your account. Please let me know how I can help. This is a post about a new theme’s release. If you’re having problems installing the application, use the forums. All other template sets are working fine. This is definitely a bug. However this is often caused by trying to limit or filter a list of entries based on category or tags - and having the resulting dataset be empty. Check to see where Mid Century might be doing this and comment out that code. Very stylish template! I wish I’d found it sooner. Building out a new site using Mid-Century as a base, and I’m having an issue with the AJAX comments “breaking” when I try to run other, rather common, AJAX components — such as Lightbox 2 (important) and MT-Hacks’ Ajax Comments (not so important). I’ve tried different orders in the HTML head, but either the comments post to an unformatted comment page (as opposed to inserting above the comment box like they’re supposed to) or it breaks the aforementioned components in similar fashion. His is confirmed by commenting out each item and checking them individually. Just installed the Mid-Century template and I can say that I’m pretty impressed with it! Looking forward to some other new designs! Really good post which help me a lot!Thank you vey much!